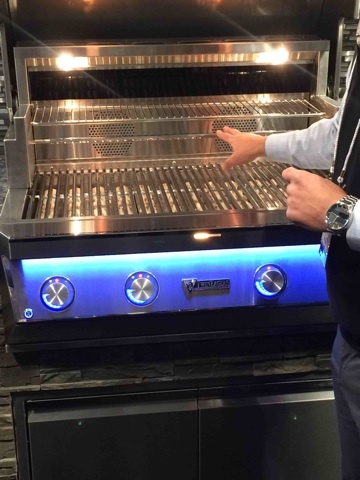 Attendees at the recent HPBExpo got a look at a new Twin Eagles grill, which includes many groundbreaking product features. “This unique grill will not replace our current premium grill offering, but it represents a step above what is currently in our line,” says Brian Eskew, head of marketing for Twin Eagles. HPBExpo attendees who examined the new grill were overwhelmingly positive about the soon-to-be-named grill. “We heard a lot of ‘wows’ and ‘I love it’ in addition to ‘We didn’t think there was much else you could do in a high-end category that makes sense, but you did,’” said Eskew. In addition to a redesigned front hood and handle, the new grill offers control illumination that features a continuous gradient illumination of the control panel for nighttime grilling, and a separate system that illuminates the control knobs and control knob temperature settings. “The illumination looks beautiful and is extremely functional, because you can see the entire control panel and the control knob settings very clearly,” explains Eskew. Another innovative feature is a zone and overall temperature reading that allows users to determine the intensity of the heat at each burner, as well as the average grill surface temperature. Each burner zone is equipped with a thermocouple and each control knob has an LED indicator light above the knob. When the burner is ignited, the LED is blue. When the burner reaches 140 degrees, the LED changes to yellow, then orange, and then red as the temperature increases. There are three color intensities that correspond with the temperature. Each of the nine color intensities indicates an approximate 50 to 70 degree increase in temperature. The same system is used in a flush, integrated bar of LEDs on the face of the control panel to indicate the average grill surface temperature. An integrated smoke removal system is also incorporated into the unit, which uses two integrated fans to pull smoke to the back of the grill surface and then releases it through two adjustable vents on the left and right sides of the grill. “This means there’s no more watery eyes or clothing that smells like what you prepared for dinner,” says Eskew. The new grill also includes an integrated rotisserie motor with two spit rod positions and an infrared rotisserie burner behind glass. This new feature eliminates the exposed rotisserie motor and incorporates it into the unit with a direct metal chain drive, offering a more convenient and attractive design. “We have also incorporated storage for the spit rod into the drip tray handle, and the rear infrared rotisserie burner is behind glass to protect it from debris and wind interference,” says Eskew.